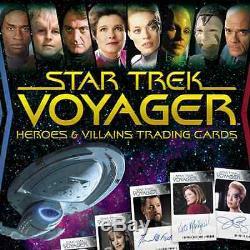 STAR TREK VOYAGER HEROES & VILLAINS TRADING CARDS FACTORY SEALED CASE. One factory sealed case, which contains 12 factory sealed boxes Each factory sealed box contains 3 authentic, hand-signed autograph cards, one complete base set, and several great inserts! Also look for randomly inserted hand-drawn and colored sketch cards (approximately 1 per case)! Also, this case contains one case topper card! 100 Card Base Set - 100 GOLD Parallel Base Cards (1:24 Packs) #d to 100 ea. 9 Black Gallery Cards (1:24 Packs) - 9 Black GOLD Gallery Parallel Cards (1:288 Packs) #d to 100 ea. 18 Star Trek Voyager Relationships Cards (1:12 Packs) - 18 Star Trek Voyager Relationships Parallel Cards (1:144 Packs) #d to 100 ea. 11 Star Trek Voyager Aliens Cards (1:24 Packs) - 50+ Autograph Cards (1:8 Packs); including the following signers. Jeri Ryan (Seven of Nine/Voyager). John Rhys-Davies (Leonardo da Vinci). We have been in this business for over 15 years! We pride ourselves in our professionalism and attention to customer service. This means that you get first class service and the lowest possible pricing for products made by these manufacturers! We sell only top quality, top condition products - all singles and sets we sell are in mint/near mint condition unless otherwise noted. 9 Item Condition : In general, all items we sell are in mint/near mint condition and any exception to that will be clearly noted in the listing description. By "mint" or "near mint" condition we are referring to the condition of the actual card i. Free of dents, dings, scratches, or other defects caused by mishandling. We are NOT referring to printer defects such as offset images, hand-signed autographs that run off the edge of the card, poor quality signatures, or any other similar issue that occured at the factory/printer. PLEASE NOTE THAT UNLESS OTHERWISE NOTED, ANY IMAGES SHOWN ARE STOCK PHOTOS REPRESENTATIVE OF THE CARD/ITEM FOR SALE AND NOT AN IMAGE OF THE ACTUAL CARD YOU WILL RECIEVE. The common exception to that is PRE-SALE items, which will be clearly noted in the description above. ABOUT BUSHKILL CARDS AND GAMES. Bushkill Cards and Games has been operating since 1997, first under the name Picard's Grand Auctions and then our new name in 2004 when we moved to the Bushkill Township-Nazareth area. And yes, we are named after a geographical place and not politically or otherwise oriented! In 2006, we added Star Trek trading card products by Rittenhouse Archives to our catalog. We continued to grow and expanded our catalog to ALL of Rittenhouse Archives products, becoming an authorized distributor for that company. Finally in 2011 we opened a brick and mortar retail location in Wind Gap PA (Northern end of the Lehigh Valley). We keep most of the current Rittenhouse products in stock in the form of sealed packs, boxes, singles, and sets. We have also begun stocking Magic The Gathering by Wizards of the Coast and Topps sports and entertainment products. We price the products we sell as competitively as possible. Without your satisfaction and repeat business, we would not still be in business! 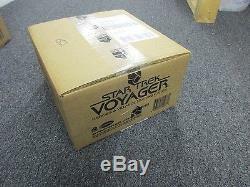 The item "Star Trek Voyager Heroes & Villains Factory Sealed 12 Box Hobby CASE with Sketch" is in sale since Saturday, July 4, 2015. This item is in the category "Collectibles\Non-Sport Trading Cards\Star Trek Trading Cards\Sealed Trading Cards".